Mike Ullery | Miami Valley Today Members of the Piqua Pentecostal Church display their brightly-colored socks worn in support of church member Abel Saunders, 4, for World Down syndrome Awareness Day at the church. Church members Chris and Amanda Saunders, top center with Abel, began recognizing World Down syndrome Awareness Day, which is on March 21, in 2017 to show support for their son, Abel. Members of the Piqua Pentecostal Church display their brightly-colored socks worn in support of church member Abel Saunders, 4, for World Down syndrome Awareness Day at the church. Church members Chris and Amanda Saunders, top center with Abel, began recognizing World Down syndrome Awareness Day, which is on March 21, in 2017 to show support for their son, Abel. 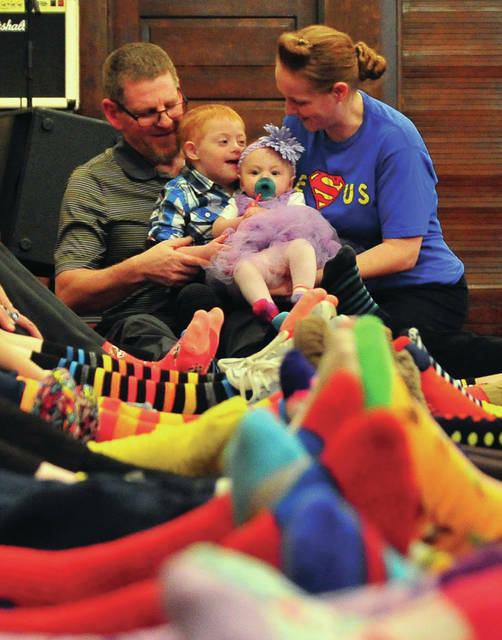 https://www.dailycall.com/wp-content/uploads/sites/30/2019/03/web1_032019mju_downsyndromeday2-1.jpgMike Ullery | Miami Valley Today Members of the Piqua Pentecostal Church display their brightly-colored socks worn in support of church member Abel Saunders, 4, for World Down syndrome Awareness Day at the church. Church members Chris and Amanda Saunders, top center with Abel, began recognizing World Down syndrome Awareness Day, which is on March 21, in 2017 to show support for their son, Abel.